Bustling Padstow with great pubs, shops and restaurants is less than 3 miles from our delightful rural location. Fabulous beaches a short drive away. Beautifully converted, detached, stonebarn with spacious accommodation for six. In a rural location yet only five minutes from Padstow and the beautiful beaches around Trevose Head. The Long barn is set at the end of a lane in a tiny hamlet consisting of four houses and a small workshop. From the large entrance hall two double bedrooms, one with ensuite shower room, one twin bedroom and a family bathroom comprises the ground floor. A travel cot is available and all bedlinen and bath towels are provided. Upstairs is a large lounge and separate kitchen dining room with external steps down to an enclosed private patio area. Paved parking for two cars and a small grassed area is at the front of the property. Around the side and to the rear is an enclosed, paved patio barbecue area. Well-behaved dogs are accepted, although we ask that they are not allowed into the bedrooms or left in the property unattended. We accept bookings of 3 days or more in low season and Friday to Friday bookings are offered from mid July through to September. A10% discount is offered for the second week of any booking. We have both been teaching in a local primary school and are now retired. Our children are all grown up and spread around the country so the plan is to tour the UK and Europe with our caravan. A delightful rural location yet close enough to beaches and the Camel estuary for all the watersports we both enjoy. Main family bathroom on ground floor. P shaped bath with shower above and curved glass screen, wc and sink. All newly replaced and decorated. Shower, sink and wc off master bedroom. Washing machine in under stairs cupboard. Oil central heating and hot water under guests control. Now Infinity fibre so fast! Spacious lounge with feature fireplace incorporating wood burning stove. Flatscreen TV with HD sky box and blue Ray DVD player. Leather L-shaped sofa plus various chairs offering comfortable seating for six. Induction so very quick and clean with suitable pans provided. Built in double oven with grill in upper oven and choice of fan or conventional in large lower oven. A plentiful supply of cutlery, plates dishes etc.. Built in, eye level, double oven, induction hob, American style fridge freezer dishwasher, microwave and espresso coffee maker plus all the essentials. Dining area with large circular table seating six plus a highchair. With Bluetooth sound bar to also play CDs or link phone/personal stereo. Many books including a large selection of children’s. Large Brio wooden train set, various toys in lounge storage cupboard. Secluded patio with tables, seating and steps up to kitchen. Trevose head golf club and the Merlin golf club at Mawgan Porth are both within 10 minutes drive of the property. 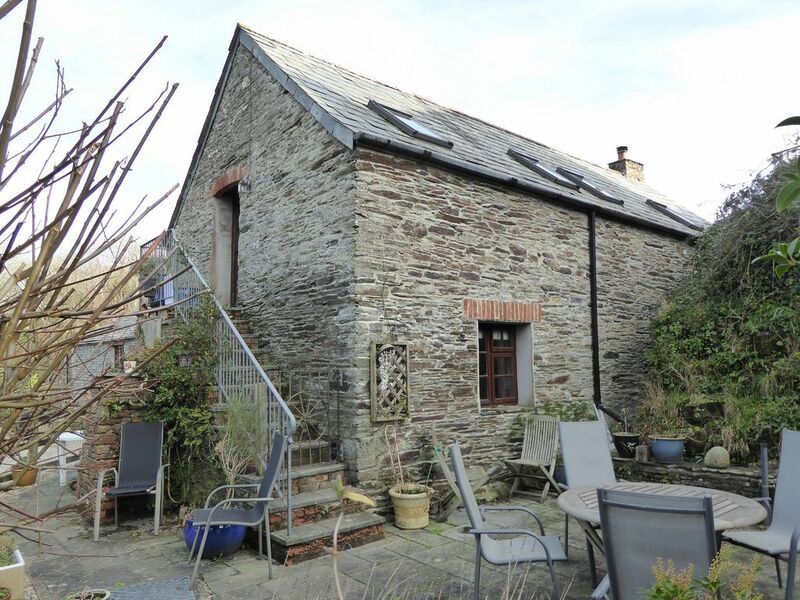 Notes on accommodation: This Stone barn was converted some 30 years ago into a delightful family home. Now available as ideal holiday accommodation. Unusually the living accommodation is upstairs with all the bedrooms down stairs. This provides delightfully cool bedrooms in the summer and airy spacious living accommodation. Beautifully decorated throughout with beamed ceilings and many features such as the large stone fireplace. Outside: To the front of the property is parking for two cars and a small grass area with a rotary clothes line. To the side and rear is a paved area with circular table seating six, a large gas barbecue and a sun shade. Cleaning / Towels / Linen / Maid service: Bath towels and all bedlinen are provided and changed on a weekly basis. Property is cleaned prior to customers arrival. Our cheeky Excape in October!! We arrived to a lovely warm greeting, with very thoughtful gifts for us, we felt at home straight away. Lovely accommodation with all you need to feel like home.. The location is perfect for exploring,(it's a shame thre is no local pub in walking distance!!) our week was truly lovely and would recommend visiting..
We loved it! The owners had provided everything anybody could possibly need including thoughtful touches like flowers & welcome groceries. A great location too - so peaceful & quiet. Friendly owners who are on site to help with anything you need, and not forgetting Quinn! Clean comfortable location with a nice selection of toys for our young children. All the facilities you can need for Cornish weather, rain or shine. We will be back. Thank you for allowing us to stay in your lovely home. Great accommodation in a fantastic location. Alan and Karen made us most welcome, allowing us to wonder in their lovely garden around old mill ponds. Alan went above and beyond posting on to us an item we had let behind. Thanks again I would recommend your home to anyone wanting to stay in the area. Wonderful and well equipped cottage (ice cube machine!). Everything you need for a relaxed holiday. The coast path with spectacular views is just a couple of minutes away. Very warm welcome with flowers, milk and wine. Strongly recommended. Within 10 minutes driving are the five fabulous beaches surrounding Trevose head. All are stunning sandy beaches offering lifeguarded swimming areas as well as excellent surfing. For calmer conditions choose one of the sheltered beaches on the Camel estuary leading towards Padstow. This area is a delight for water sports enthusiasts. Sailing and waterskiing are very popular on the Camel estuary. Padstow sailing club is nearby where temporary membership is available. Newquay airport is 20 minutes driving time from the property. The ferry port of Plymouth is within 40 miles. Due to the rural nature of the property a car is highly recommended although bus services do run from the bus stop a five minute walk away. Padstow with harbour, great restaurants, shops and camel trail cycle route is less than 4 miles away. Within 5 miles are the superb Atlantic beaches of Treyarnon, Constantine, Boobys, Harlyn and Trevone. Retallack resort and spa offers wake boarding, a spa, indoor pool and flowrider and is 5.5 miles away. Booking Notes: A £200 deposit is required to confirm a booking and balance within 6 weeks of arrival date via owners direct. Rental charges include cleaning, car parking, electricity, central heating, linen and towels and fuel for the wood burning stove. We normally let Friday to Friday for full week breaks and offer a 10% discount on second and subsequent weeks. Changeover Day: Friday changeover offered to avoid the Saturday traffic jam which the A30 can become in the summer. Guests are requested to leave by 10am and arrive no earlier than 3pm. Can be flexible if no conflicting bookings.